Even though Paddy Holohan and Louis Smolka put on a show after being promoted to the main event of the last Irish UFC card in October, there is a general sense that the island is owed something big when the world’s flagship promotion returns to Belfast in November. The calamitous countdown to the last event on the island saw both the co-main event and the main event pulled at the eleventh hour. Nine days ahead of the October 24 event at Dublin’s 3 Arena, Ben Rothwell’s bout with Stipe Miocic was called off after the future heavyweight champion sustained an injury. With no time to play with, UFC were unable to find a “suitable replacement” for ‘Big Ben’. The Wednesday before the fight was set to go down, UFC also pulled Joe Duffy from his main event meeting with Dustin Poirier due to a concussion he suffered ahead of the bout. Poirier was offered Norman Parke as a replacement but decided to wait it out until he eventually claimed a decision win over ‘Irish Joe’ in January. 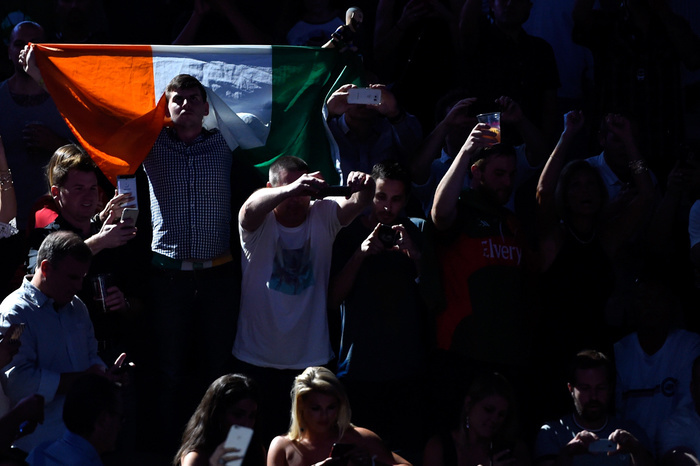 With UFC Belfast announced at the press conference for UFC 204 at the MGM Grand last week, both fans from the Republic of Ireland and Northern Ireland are hopeful that the card will pack a punch. For that reason, we’ve taken a very optimistic look at how the Fight Night card could unravel. Ariel Helwani’s report that claims honorary Irishman Gunnar Nelson is being targeted for the main event of the show against Dong Hyun Kim has created a lot of excitement ahead of the November 19 date at the SSE Arena. However, Irish fans will still want what they missed out on back in October.